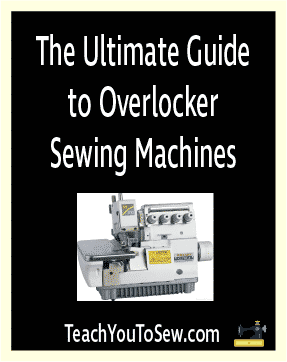 Overlocker sewing machines are also known as sergers. These machines are used mainly in the finishing of garments to give a neat and professional appearance to the insides. They can also be used to construct complete garments because you may also have the option to stitch and serge simultaneously on some. I personally like the overlocker because it offers versatility in the types of finishes you can use on your garments. 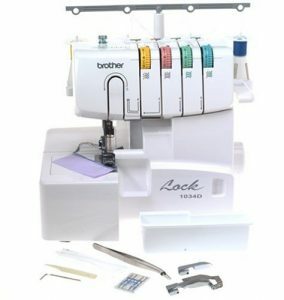 With this machine you can choose to use 2, 3, 4, or 5 threads, which allows you a great variety of overlock finishes. The speed of 1300 stitches per minute allows you to get through sewing projects efficiently. If you are not so proficient yet, you can choose to go slower. It is quite simple to thread and comes with a diagram and colour coding for added ease. I am truly sold on the fact that this machine has a fully automatic tension adjusting system. With this machine you can also adjust the stitch width as well as how much of the fabric you want to be cut off. The 14T968DC also comes along with 7 presser feet, tools, other accessories, a CD and a manual. This popular machine is a favourite for many and my personal favourite as well, because I own one. The fact that you can turn the knife on and off, allows you to achieve pin tucks and flatlock stitches. It has 22 stitch functions for the 4 and 3 thread overlock stitches and it allows you to do decorative stitches and gathering too. With this versatility, it accommodates a wide range of fabrics and you can even use it for formal garments, embroidery and craft projects. 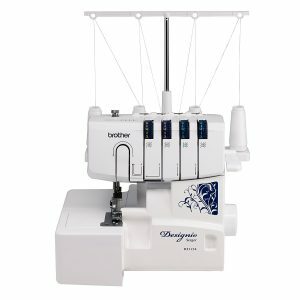 The differential feeds for thread allows you to enjoy even stitching on any type of fabric. The colour coding on the tension dials, inside the machine, coupled with the instructional video and diagram makes threading a breeze. It also comes with a removable arm to accommodate smaller pieces and sleeves, and uses standard sewing machine needles. As a bonus, you get two presser feet, a soft cover, needles and tools plus a few other accessories with this buy. You can purchase other specialized presser feet for functions such as adding elastic and cording. It is not recommended that you use this Brother sewing machine with a voltage adapter and the recommended voltage it operates at is 120 V AC. What I love about this serger is the fact that you no longer need to be afraid of threading your machine. It has both a needle threader and also air assisted threading for the loopers, which means zero hassle for you even if you break a thread while sewing. You just push the air on button, and a jet of air pushes the thread though the tubular loopers, which can be threaded in any order you choose. 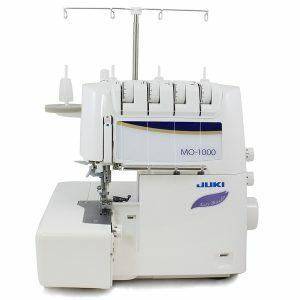 The Juki MO-1000 also comes equipped with a scrap catcher, screw driver, tweezers and a couple of other accessories but no extra presser feet. 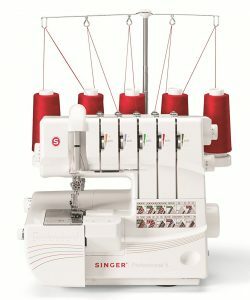 I quite like the fact that this machine comes with four different types of rolled hems which gives you a variety of looks for finishing lighter fabrics. You can achieve 2, 3 and 4 thread stitching options with this model, which adds to the versatility it provides. It also comes with a free arm, which you can convert to easily to by removing the cloth plate to accommodate your smaller items. The knife is also removable to accommodate stitching without cutting. The colour coded diagram inside the machine and the tension dials which are also colour coded, makes threading easy to follow. 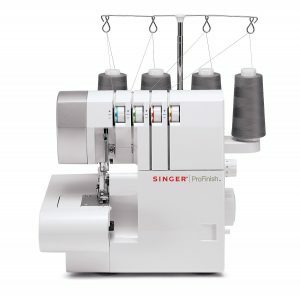 Equipped with differential feed for smooth and even stitching, this is an excellent machine in my opinion to give a professional finish on all your projects. The Singer 14CG754 is made for use in countries which have 110V AC power supply. Before I go, there’s just one more overlocker sewing machine that I need to tell you about. What I like about this machine is the inclusion of three additional presser feet; the gathering foot, piping foot and blind hem foot. This makes a total four feet counting the all purpose foot which comes fitted to the machine. Other accessories include a trim trap, thread net, soft cover, needles and the regular tools for threading and maintenance. I also really like that they have included not just one, but two sets of thread for you to start with. This means that once you get your machine you are ready to sew. With this purchase, you will receive an operation manual with an operational CD, and if that isn’t enough, you also get a techniques manual plus a techniques CD. This means that you should be able to readily find an answer to any troubleshooting issues you may have. The removable sewing surface allows you to reveal a smaller sewing area to work on small pieces like children’s clothing and narrow sections of adult clothing. Be mindful that the manufacturer recommends that this model only be used in countries which use 120V AC and does not recommend use with a voltage adapter. All these overlocker sewing machine models come with a stitch speed of up to 1300 stitches per minute so they operate pretty fast. Make your choice based on the types of features you are interested in and the kinds of projects you will be sewing up.